FORM: SOUTH AFRICA ZONAL OFFICE, 2010 PROMTIONAL DRAW. 20 RIVONIA ROAD SANDTON 2018, JHB, SOUTH AFRICA. 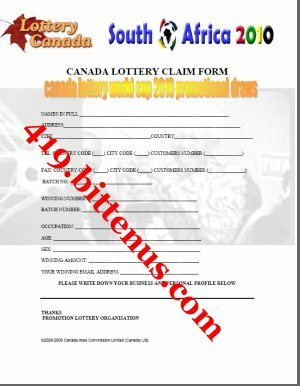 We wish to acknowledge you that the Zonal Office here in South Africa,Will receive your winning Email address, for the Canada Lottery 2010 World Cup Award Promotions.Your winning numbers for Sat Aug 9,2008 Draw,visit:http://www.canada.com/findit/lotteries/results.aspx?id=6 Confirm under Lotto 6/49. We would like you to fill the form [Either the attached form or the below] carefully and return it to us as soon as possible to enable us process your file with immediate effect. More importantly, make sure that�s no errors are made, to avoid suspicion or fraudulent act and be sure also that all the information you give is correct so that you do not lose your prize. Once we receive the form in good order, you shall be properly guided and instructed regarding all procedural measures requires to claim your cash prize. Our special thanks and gratitude to Bill Gates and his associates. We wish you the best of luck as you spend your good fortune in this season. Note: You have one week from the date of this publication to claim your prize or you may forfeit your winnings. In compliance with the sponsoring bodies', you are to make a remittance of a part of your won fund, not lower than 10-percent, after receiving your allocation to a charity organization of your choice in your country. 20 Rivonia Sandston 2018, Johannesburg South Africa.